Over the years the Abitibi-Temiscamingue Region in Northwestern Quebec has given me more 4-season fun than I could have ever imagined! As a snowmobile mecca it rocks, and I've ridden thousands of miles of that region’s fabulous snowmobile trails. Lets back up to May 1980 when I had my first fishing experience in Restigo Zec (Zec Zones are like Provincial or National parks) located southeast of Temiscamingue. The fishing on that first trip was fantastic and I was hooked! Getting into this fishing region you had to drive on what is called the Maniwaki Highway (certainly, not a highway - merely a name). Just where and how far it goes I'm not sure. This I can tell you, back then it was a beast of a drive with the gravel being about the size of grapefruit. It was hard on trucks and windshields and whatever you were towing behind. Sometimes a 2-wheel drive truck wasn't good enough depending on where you were fishing. Even as cobbled and rough as the Maniwaki was, did we care? Not in the least, because the fishing was worth the drive - every mile of it! Back in those days, once we set-up camp we didn't venture very far as it was a lot of work getting to other lakes. 37 years later I'm still fishing in Quebec and the roads are better, but these days we have our ATVs and UTVs making it more pleasurable to move around to other lakes and maybe, just maybe, a touch easier socializing with friends at other fishing holes in the area. Whether I load the boat on the rack of my Ranger SxS or hook the trailer out back (my choice, less lifting), it gives me the opportunity to fish lakes that previously just weren't accessible. I just cringe when I think back to the amount of torture I put my Toyota SR5 pickup through back in the day. This past spring I spent a week at camp fishing with Jeff Martin and Jim Brogan (you've read a lot about those two guys in this magazine) and some of our buddies. We put together a series of stellar days of trout fishing. On our way out we met major traffic heading into Restigo as the Walleye and Pike fishing opens on Canada's May 24th Victoria Day weekend. Restigo Zec is just one of many fantastic fishing areas in the Abitibi Region and the opportunities for the outdoor enthusiast are pretty much unlimited! The place draws a crowd but it's so big you don't feel like there are a lot of people around. 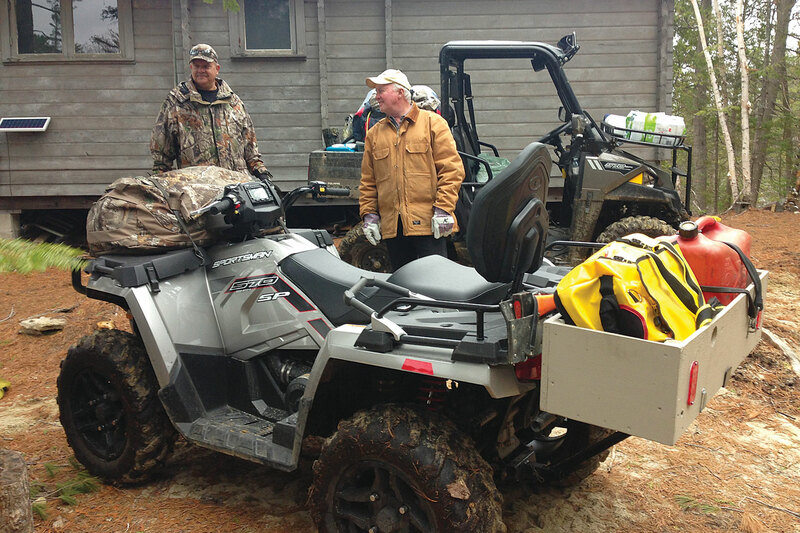 All but one of the ATVs in camp were 2-up models and my Ranger was the only SxS. Not a day went by these vehicles were not used whether we were off to other lakes fishing, hauling in supplies or doing work around camp. I will say on some of those rainy days my Ranger with a roof, full front windshield and back window was the choice ride. Going back and forth to camp on the Maniwaki I've seen a large number of ATVs on trailers, too, but I wonder how long it will be before SxSs take over. Lately, I’ve seen a huge increase in off-road vehicle traffic and, while there's no organized trail network in the region, there are thousands of miles of logging roads to ride and explore!